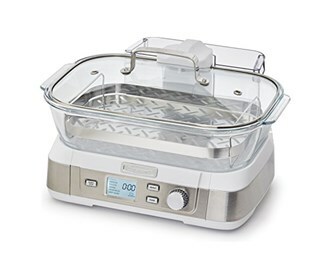 The Cuisinart Glass Steamer is a new Cook Fresh™ Digital Glass Steamer. A powerful steam system delivers steam from the top down, surrounding food to cook quickly and evenly. The 5-liter glass cooking pot is large enough for family-size portions of vegetables, fish, chicken, rice and more. And the steamer’s 1-liter water tank conveniently lifts off to fill. Healthy cooking is today’s biggest trend, and this new glass steamer from Cuisinart makes it quick and easy. The Cuisinart Digital Glass Steamer has many exciting features for users of all types. 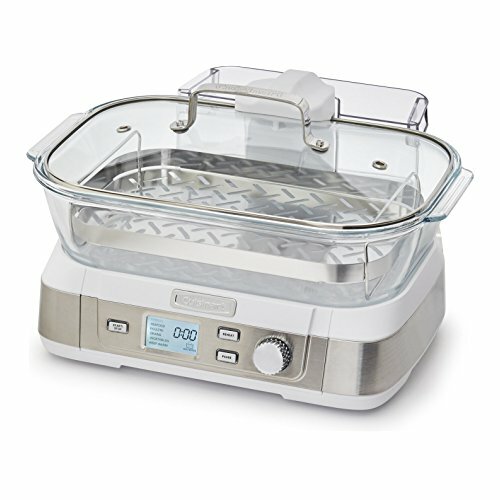 You can extend the lifetime of your Cuisinart Digital Glass Steamer with the purchase of a FactoryOutletStore Factory Protection Plan. See the Cuisinart Digital Glass Steamer product video and gallery images above for more details. The Cuisinart Digital Glass Steamer is sold as a Brand New Unopened Item.